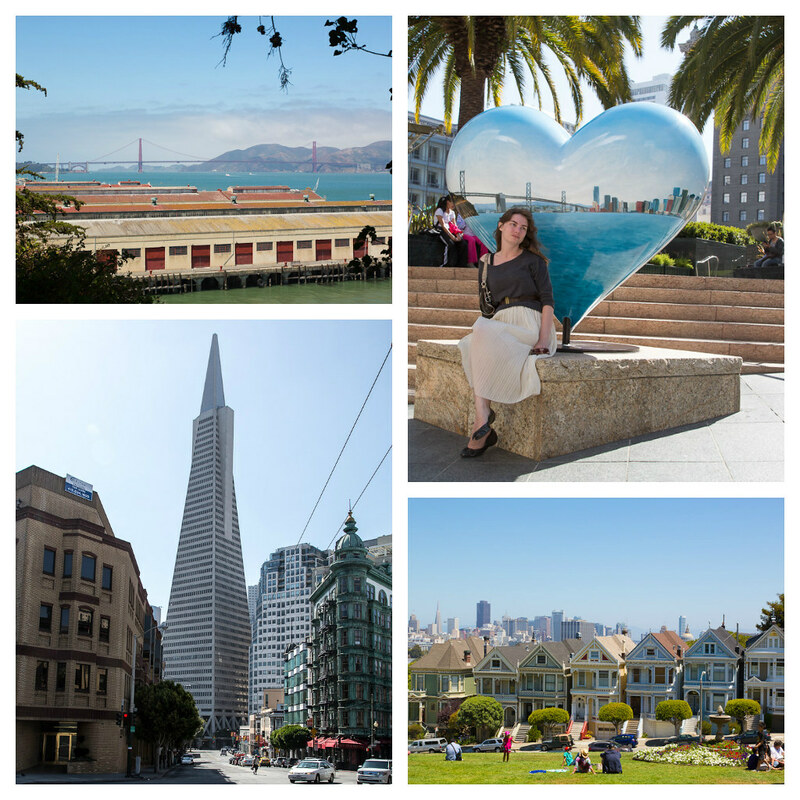 One of the absolute best decisions of the trip was Amos' insistance that we book a walking tour of San Francisco. 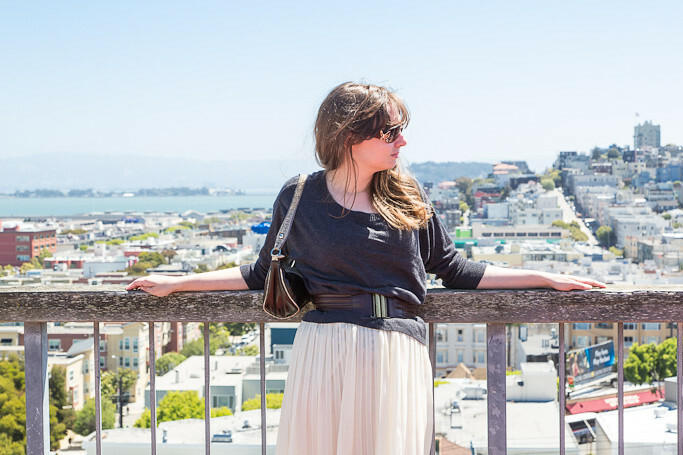 The Real SF Tour took us through most of the major neighborhoods in the City, showing off hidden gems, such as this gorgeous lookout point on top of the San Francisco Art Institute building (Bonus: In addition to this great view, the school's got a Diego Rivera mural on public display!). From the narrow alleys of Chinatown to underground speakeasies, from cable cars to walking by the bay, from murals in galleries to graffiti on brick, we went through Downtown, Chinatown, North Beach, Russian Hill, Lombard St., Hayes Street, The Mission, The Castro District, The Marina and more all to end the day on a rooftop garden! Five miles were walked in all (plus the extra mile to get there to our meeting place! ), plus all five forms of public transport. 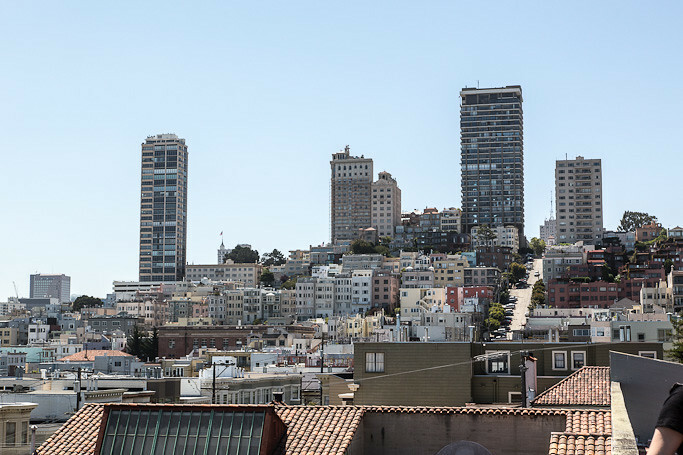 With all the hills people in San Francisco must be in great shape, but I wonder if all those ups and downs result in more knee surgeries? Because mine were feeling it after just one day! Totally worth it though. As for this outfit- it was perfect for the trip. The skirt was easy to walk in and billowed out beautifully at any slight breeze making me feel, however momentarily, like a princess. I'd worried about being too hot- even with all the talk of San Francisco's so-called "Micro-climates"- but the sweater stayed on most the day. Come to Wyoming mild California weather! you look amazing <3 just emailed you! That skirt is just gorgeous! What a great piece to own. I love hearing about your trip, it looks like so much fun. Can't wait to see more! 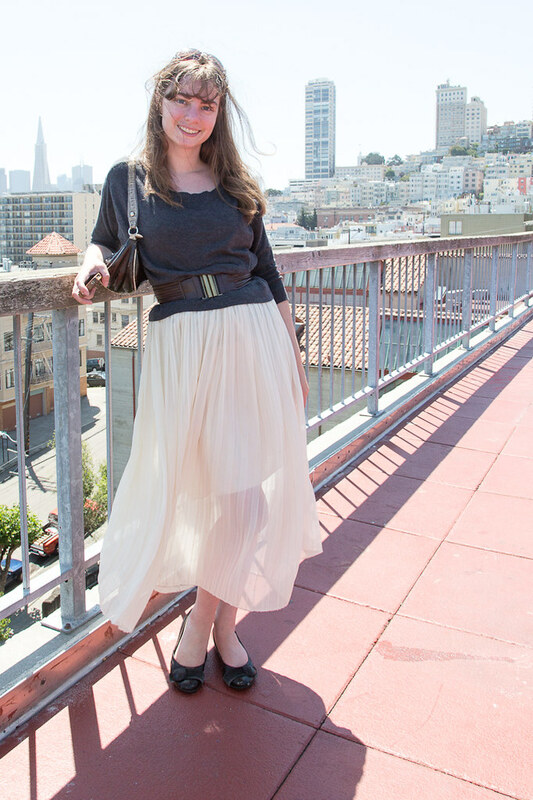 Oh how I adore San Francisco, and that skirt of yours! This outfit is so pretty. I love this skirt so much! Sounds like a wonderful trip- such a lovely outfit..perfect for San Francisco! another beautiful outfit and set of photos!! Love that last one, you look amazing! have a beautiful day! Love this breezy look! You look gorgeous dear! super duper love your skirt! Beautiful photographs you looked so stunning! I love how you matched a casual baggy jumper with such a floaty feminine skirt...I definitely will be trying this out! i like this idea of sharing archives through twitter since it's impossible to see all your old posts but certainly fun to get caught up on a few! i bet people have less knee surgeries than those who sit around all day & get too big but who knows if that's true or not. love that we went all these places too on our day lay over there. great shots! Oh, Dus, thanks for commenting! I always enjoy when bloggers I follow on twitter share their archives, so thought it might be fun to try. I bet you are right about the knee surgery, for sure! How fun that we saw a lot of the same sites!